If you have seen my blog before, you'll probably sense that I am not very fond of Arizona State University. Leaving that aside, I do know quite a bit about the university since I am a former Arizonan. From my sense, people never had a whole lot of beef against ASU other than the fact that they have the highest undergrad population in the country, have consistently been named one of the best party schools, have the highest rate of STDs in a college campus, have a plethora of California chicks and bros that decided to attend their safety-safety school, have an alarmingly high number of alums that went on to be pornstars, and have a Devil as a mascot. In this post, I want to zoom in on their mascot Sparky. 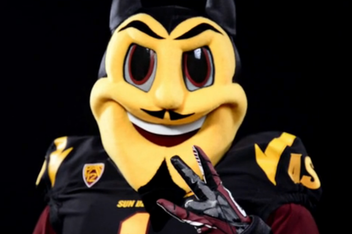 ASU's mascot wasn't always a fiendish, pitchfork-wielding imp. Arizona's Second University was initially called Tempe Normal School and their mascot was the Normals. Soon, they became a state school and toggled through a bulldog then owl mascot. After a while, an ASU alum that was fired from Disney was given the task of creating a new mascot for the school. 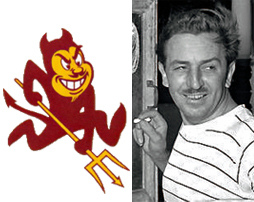 He then sent ASU a devilish caricature of Walt Disney, which has since become the image of ASU and has been named Sparky the Sun Devil. This new look is unnecessary. It is tasteless, scary, and designed by Disney (pretty ironic). A classic case of "If it ain't broke, don't break it" in the sports world. The old Sparky had almost a stuffed animal charm about him, but now, it seems as though I am looking into the eyes of Lucifer himself. The mascot was intended to be more "child-friendly", but it looks more like a child's worst nightmare. Before, it seemed as though the devil-mascot debate has always been a silly argument, but now, this mascot gives it a devilish twist. At least it's Sunday so I can go pray.